My flgs is selling all their Netrunner packs at 70% off, if anyone is missing any I can look and see if they have it. Do they have Sovereign Sight by any chance? I will look next time I'm there. At Ease Games in San Diego, off Miramar Road. No big boxes that I saw, just clampacks. It’s too much of a shame to ignore half the cards I just got, and playing Sunny is still fun! You can just buy the World Championship winning decks for the last 3 years, FFG sold them as complete decks with special pretty art cards. They're all completely full of banned cards but if you don't care about that and are just looking for strong preconstructed decks they should serve you well. Yeah I saw those earlier today! Which ones would you recommend picking up? I’m not really a fan of gimmicky decks, I think it’s more fun to have a strong all-around deck that can adapt to the circumstances. 2016 (Whizzard vs CtM) are probably the best balanced play experience and most similar to 'normal' netrunner play patterns as you would find the core sets. Both are well over the power curve for standard decks. The runner deck has a lot neutral staples you'll use in all your runner decks. 2017 (Hayley vs CI) are good but very intricate decks that probably aren't great for newer players - messing up the plays can be a real feels bad moment (famously in the semi-finals Wilfy (the 2017 champion) took a 14 click turns with the CI...and its not even a combo deck, you can just use its tools for crazy plays). Again the runner deck is good for picking up neutral staples you'll use in all your runner decks. 2015 (EtF vs Valencia) - Etf is a sold deck that I actually would recommend for new players (though you'll learn why caprice rotating ;)). It plays a standard netrunner game plan. The runner deck is a hideously degenerate negative play experience deck that caused cards to be immediately errated. I would not recommend it at all unless you want the cards. You know, the more I look at it... the more I like Crowdfunding? With Underworld Contacts gone (aaaaaaaaaaaaargh), I'm thinking about maybe splashing one or two in my Sunny deck. The 0-cost is very nice, and I can probably easily hit that three-run target with Jak. Initial results from Lauriepalooza indicate Val with 3 crowdfunding is both best Val and best deck. Current glacier is crumpling to it. Anarch not really needing influence to work (as evinced by the fact that Val can spend 10 influence on Crowdfunding and Rebirth, none of which are necessary to make the deck work) continues to be an argument for best runner faction. In case anyone's interested, NISEI's going to be running a online Core Experience (aka single System Core '19 only) tournament on j.net. Article's not up yet, but it'll be here later today. The two different swiss rounds will be on January 26'th (1 PM GST) and January 27'th (1 PM CST), top cut on Feb 3'rd. surprised at how hard it is to find some of the newer packs for anything sane. although tbf even the one's amazon has add up to 200 dollars for me to complete. Also a new NISEI article showing off the Q2 GNK kits. Playmat’s art from a upcoming unnamed Ashes cycle card. Crowdfunding and Dorm Computer (yes, really) restricted. Play vs the try-hard Haley with any tag based strategy (ie all of nbn and most weyland) and you'll see how dorm computer is the capstone in that decks invulnerability. Also, next week the spoiler season for Downfall, the first half of Ashes, starts. Downfall itself should be out March 18'th. Not saying I’ve really seen it myself, but that hayley deck is real strong vs the enter NBN faction so if the MWL peeps say its too good in competitive hands I believe ‘em. Also woo spoilers, gonna be a fun ride. Also, article talking about Regionals 2019 is up. We get some semi-scoops on there, since you get a first look at the new Crim runner (no wonder your mom loves a program more than you, she's disappointed you're blue), and a bit of the NBN ID? Also interesting that it looks like they're putting base MU directly on the runner ID's from here on out. That... makes a lot of sense, actually. The NBN ID alt art is just ACME. Buff to Chaos Theory! I'm really happy at the templating and wording clean up that's going on with the new cards. Shows how often I play against NBN that isn't CTM. New scoops article: Analog Dreamers. New HB asset and a new piece of Crim hardware. Psh what loser wrote that article? Couple of new corp previews in here. Starting with a new Shaper program named Rezeki. Simple and clean, I'll take three for my Sunny deck please. Three Criminal scoops, courtesy of Trace Five. *points at Flip Switch* Cheese it! And here we. Dead Channel has three spoilers, a NBN one and two Weyland. Link. And the scoops don’t stop coming. 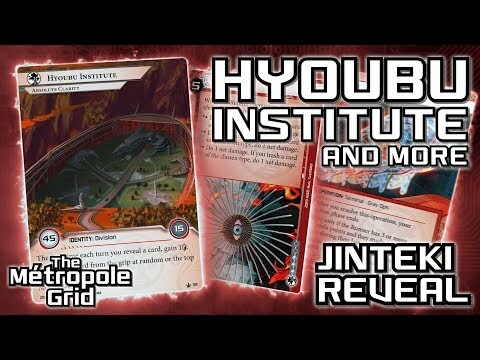 The new Jinteki ID has been previewed, as well as a couple other things. EDIT: And for the runners across the pond, they announced the Euros Championship 2019. Will be taking place on the 31st of May (Day 1) and 1st of June (Day 2) at the UK Games Expo in Birmingham, United Kingdom.